Editor’s note: Amesbury has a rich and fascinating industrial history shaped over the centuries by the many people who worked in the shops and factories scatted throughout the town. Whether these workers sawed lumber, built ships, spun yarn or wove cloth, made carriages and more - the legacy of their industrial heritage can be discovered in the landscape. The following article explores the period from about 1900 to 1930 when Amesbury was a center for building automobile bodies. This article is only part of Mike Harrold’s Walking Tour: Millyard And Water Street Auto Body Manufacturing Sites available on the Amesbury Carriage Museum website. A volunteer researcher on the Industrial Survey Team of the carriage museum, Mike has given countless hours to researching and compiling Amesbury’s industrial history. The Amesbury Millyard was the site of iron works, grist and saw mills, and textile mills since about 1640, powered by 75 feet of drop in the Powow River over about an eighth of a mile. Brick buildings along the Powow were originally textile mills, large and highly industrialized for their time. They had large capitalizations financed by wealthy Boston investors, and after textile decline the buildings found other uses, including auto body manufacture. From the early 1850s, Amesbury developed a carriage making industry. Factories were away from the river, mostly without any power at all. Amesbury became a major carriage city in the niche of high-quality craft-built vehicles. Factories were of only moderate size, capitalization (local), and industrial sophistication, even for the carriage industry. They used rationalized semi-industrial methods for efficient production. They never recovered from the depression of the 1890s, losing business to large and highly industrialized factories in the mid-west that were making low-cost consumer commodity carriages. After 1900, carriage factories were rapidly electrified and converted to production of auto bodies. Once again, moderately sized factories carved out a boutique niche of upper end bodies for Buick, Franklin, Stanley Steamer, Cadillac, Hudson, and many others. That came to a rapid end with the Crash of 1929 and the Great Depression. Many of Amesbury’s auto body customers were then consolidating operations and vertically integrating body making into their vastly larger, highly industrialized, and closely coupled mid-western plants. That trend was occurring, even without the Depression, so that the end was inevitable. Amesbury focused on high-end auto bodies, especially elaborate enclosed cars. There were 20-25 firms in the business for much of the 1905-1930 era, many having extended relationships with specific customers. That could be beneficial for dependable sales, but become perilous when main customers encountered financial difficulties or failure. The two largest were Walker Body Company, which began as Walker Wells, and Biddle & Smart, which already had large Water Sreet facilities when the automobile age began. 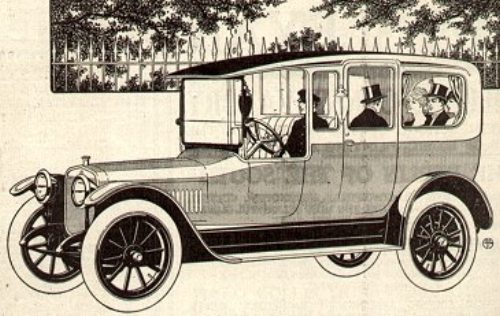 In 1918, Walker Body Co. received substantial investment from H. H Franklin Car Co. of Syracuse, New York. There was a geographic concentration of companies. Biddle & Smart dominated the Water St. area. Walker Body Co. was in the Railroad Avenue area, used most buildings remaining now on Carriage Hill, and occupied what is now the large apartment complex on Oak Street. Pettingell and Currier Cameron & Co. occupied most of the Elm Street complex. Surviving the Great Depression, The Bailey Co. occupied numerous local buildings during mid-20th century. Buildings of interest on the Amesbury car body makers walking tour. Red circled numbers are keyed to the details below. Built 1863 for textile milling. Occupied in the mid-1920s by The Bailey Co. for making felt lined channels for sliding door-windows. Built in 1825 for textile milling. 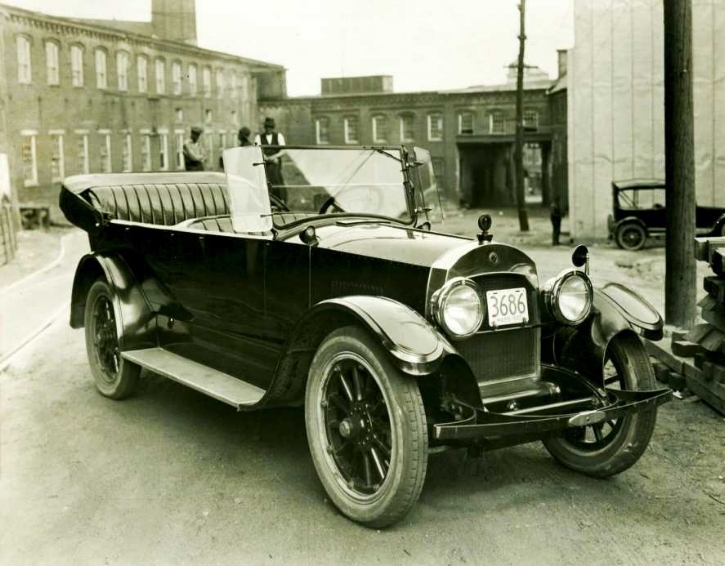 Occupied by several prestige auto body companies, and finally by The Bailey Co.
1920 Cadillac Type 59 GWM with body by Hollander & Morrill, who occupied Mill 2 from 1918 to 1925. Photo taken in the Upper Millyard about 1922. Built in 1870 for textile milling. Home to an auto painting contractor who was seemingly successor to a previous such company named Durling-Price. Built in 1871 as textile company boiler house. The first two floors were immediately occupied by Charles Wing, a large purveyor of hardware for carriage makers. Wing changed with the times to providing similar hardware to auto body manufacturers. The building was finally used by The Bailey Co. Built in 1854 for textile milling. After textiles, Mill 4 spent part of its time hosting shoe companies, which became an important mid-20th century Amesbury business. The Bailey family still owns the building. Built in 1876 for carriage body making. One of several buildings built 1876-7 by William Biddle after fire destroyed his original shop. Biddle joined with William Smart in 1880 to become Biddle & Smart, and they subsequently expanded to numerous buildings on Water Street. Their company committed heavily to auto body making in 1906, building the foundry next door that later became the city street department garage. The existing building became part of the foundry operation. Built in the 1950s on the site of previous Biddle & Smart factories. Except for one older building (ca. 1925), the Quonset huts and parallel building occupy the former site of the town’s second largest factory, where Biddle & Smart made both carriages and auto bodies. The Bailey Co. built the newer buildings after WWII as storage and machine shops, subsequently passing to Bartley Machine Co., which closed in 2016. Built in 1884 as commercial rental space. Built by the Colchester Mill Co. in 1884 and leased to John S. Poyen, major purveyor of hardware for carriage makers. Pettingell Machine Co. then began making auto bodies and machinery there, spawning the related Bella Body Co. The Bailey Co. used the building mid-20th century as part of their sprawling business making felt-lined channels for automobile-door sliding windows. Built in 1882 as commercial rental space by the Colchester Mill Co. First Amesbury home of S. R. Bailey (from Maine), maker of carriages and sleighs. Currier Cameron & Co. then occupied it, with Bailey, also making carriages. Currier Cameron later began making auto bodies for Duryea, Stanley, and Locomobile, producing a majority of the Stanley Steamer bodies. Currier Cameron failed after Stanley went bankrupt and defaulted on debts. Built in 1866 as textile mill, having steam and water power. Original building of the Colchester Mill Co. and operated as a textile mill for 10-15 years. It was then leased to a carriage wheel maker, after which the Colchester Mill Co. became essentially a real estate firm. In the early 20th century, Gayden Morrill of Hollander & Morrill auto bodies was president of Colchester Mill Co. This building no longer exists, although portions of its engine house remain, at rear. 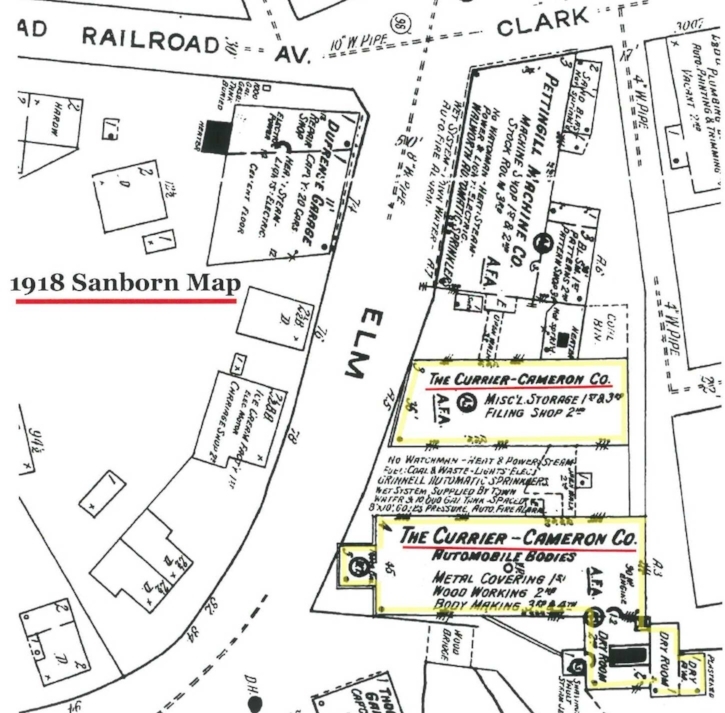 1918 insurance map showing 79 and 85 Elm Street (yellow highlight) as occupied by Currier Cameron & Co., who made most of the bodies for Stanley Steamer autos. Except for parts of the rear engine house, the building at 85 Elm (highlighted building nearest the bottom of the map) no longer exists.